Article by CGTN to say “Welcome Home!” to the Beijing Swifts. The Beijing Robin in The Daily Express, thanks to Stuart Winter. Article in Audubon about the Beijing Robin and how it illustrates the growth of birding in China. Interview on BBC World Service about the Beijing Robin. The Beijing Robin shares the BBC News front page with latest Brexit news. Government vows to rehabilitate Yangtze River ecosystems. By Caixin. Camera trap photos of a Snow Leopard covered by Fox News and the Mail Online. An article on Xinhua, China’s largest news agency, about the breeding BAER’S POCHARD. 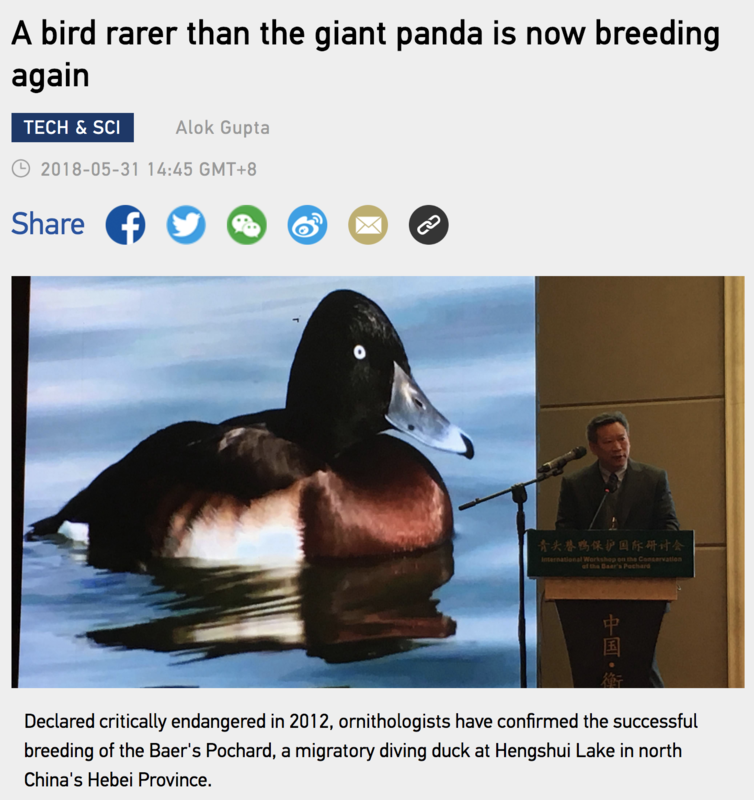 CGTN coverage of the successful breeding of BAER’S POCHARD at Hengshui Hu in Hebei Province. A tribute to Flappy in the Beijing Youth Daily. A tribute to Flappy in Sixth Tone. Article in the Beijing Youth Daily about Flappy McFlapperson, the Beijing Cuckoo. 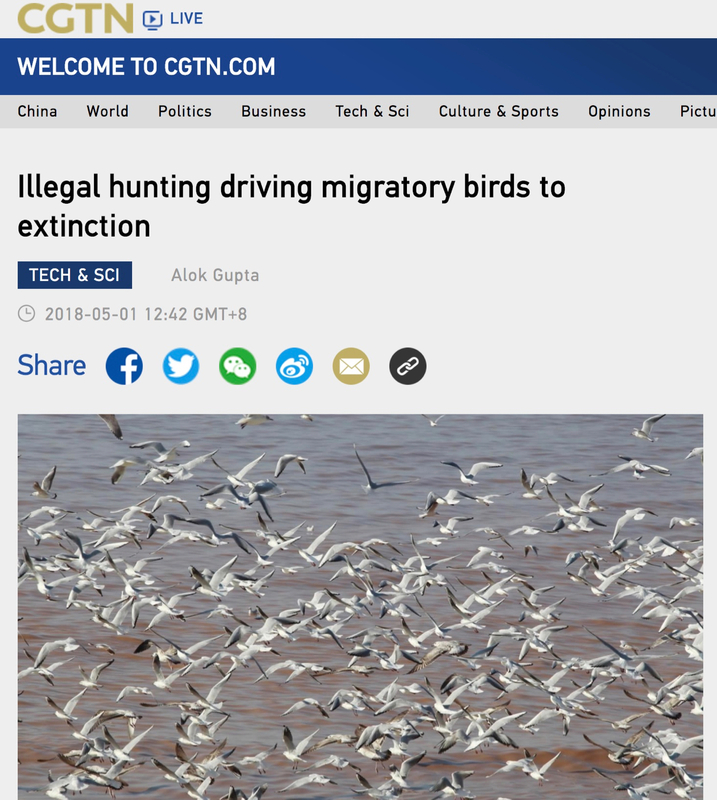 CGTN article about the BirdLife Flyways Summit and the Chinese government’s recent announcements about protecting migratory birds. Xinhua article about the Baer’s Pochard workshop at Hengshui Hu, Hebei Province. CGTN (CCTV’s English-language channel) article on the Baer’s Pochard Task Force workshop at Hengshui Hu. CGTN article about how China is swapping coastal land reclamation and pollution for festivals to celebrate the birds! Terry’s article on the Wilson Center’s New Security Beat about China’s decision to halt land reclamation along its coast. Article in The Beijinger about Yellow-breasted Buntings for sale on Taobao (China’s eBay). A year after the Beijing Cuckoos featured on the front page of the New York Times, Flappy is still reaching more and more people worldwide. This article published today in Daily News and Analysis (DNA) in India. Birding Beijing’s footage of Snow Leopards and Pallas’s Cats featured in a 2-hour long profile of Qinghai on CCTV (Chinese state television) in celebration of the end of Xi Jinping’s first term as president. 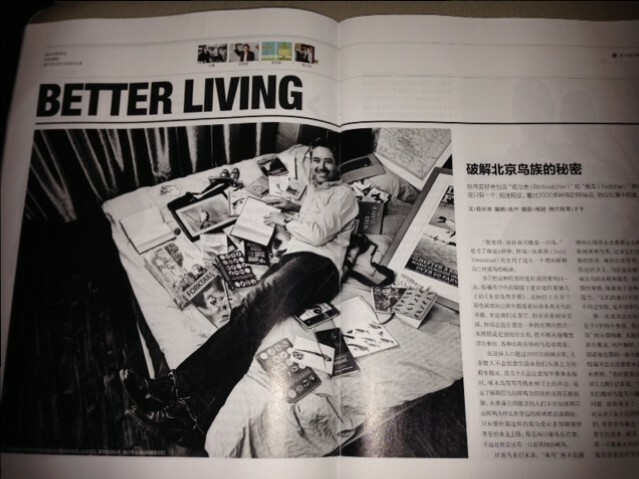 Feature in the Sep-Oct edition of The Beijinger. Speaking at the launch of “Unusual Lives”, a book documenting the stories of 29 people (Chinese and foreign) in China. At the Beijing International Book Festival. Article in China’s Ministry of Foreign Affairs magazine about birding in Israel and Champions of the Flyway. Written by Chen Ting. Terry’s Snow Leopard footage is shown on Chinese State TV, CCTV13, as part of a piece on Sanjiangyuan National Park. An article in The Diplomat about the return of Flappy McFlapperson, the Beijing Cuckoo. Two articles (in Chinese) about the launch of the exhibition of 19th century bird paintings in Beijing. And the Beijing TV coverage of the launch. Article in Jing Kids magazine about birdwatching in Spring in Beijing. Beijing’s first Harlequin features on Beijing TV including interviews with Dr Ji Jianwei and Shi Yang of Beijing Wildlife Rescue and Rehabilitation Centre (BWRRC), the main partner for the Beijing Cuckoo Project. A very good online article in The World of Chinese about the Beijing Cuckoos. PDF can be downloaded here. The African Times welcomes 梦之鹃, the Beijing Cuckoo, to Africa! The Beijing Cuckoos in the China Daily newspaper and in Xinhua, China’s biggest news agency. Interview in Beijing Kids magazine. The New York Times article featured on the front page of the international edition on 15th November. An excellent article by Chris Buckley, the New York Times correspondent in China, on The Beijing Cuckoos. Live interview on BBC World Service about poaching wild birds in China. Article in The Times of India about Flappy, one of the Beijing Cuckoos. Article in The Times about illegal poaching in China. Article by Cuihu Wetland about Flappy, the Beijing Cuckoo (in Chinese). Article by 山水 (Shan Shui) about the Wildlife Watching Competition in Qinghai (in Chinese). BBC Wildlife Magazine covers the Beijing Cuckoo Project! BTO press release about “Flappy”, one of the Beijing Cuckoos. ABC article on the expansion of birding in China, including interviews with young Beijing birders. A brilliant series – jointly produced by Australia’s ABC and the BBC World Service – about the miraculous migration of shorebirds from Australia/New Zealand to Arctic Russia via the Yellow Sea. Episode 3 touches on Beijing and birding in China and includes a snippet from the interviews conducted with Beijing birders on the Wenyu River in April 2016. Article in the Beijing Science and Technology Daily about the Beijing Cuckoo Project. LA Times article on birding in China. Li Qingxin (Grace) from China Birdwatching Society, featured in the article, here photographed at Yeyahu Nature Reserve. Article in the Zigong media (in Chinese) about the Earth Day Lecture. Article covering TT’s “Earth Day lecture” at Zigong Dinosaur Museum, Sichuan. A tour of the museum before the lecture to learn about the history of this unique place. Yifan and Yumo – the engine behind Zigong’s new birdwatching society and lovely people! Article in TimeOut Beijing, featuring Jankowski’s Bunting. Interview on Talking Naturally about birding and conservation in Beijing. Article about Jankowski’s Bunting and Birding Beijing on 10,000 Birds. March edition of World Birdwatch includes articles on Jankowski’s Bunting and 10 years of BirdLife’s China Programme. BirdLife International article about the remarkable occurrence of JANKOWSKI’S BUNTINGs in Beijing this winter. Sinica Podcast about the Beijing Swift, and the Beijing 2022 Winter Olympics and the monkeys trained to destroy birds nests ahead of the military parade. Interview on BBC World Service radio “World Update” about the first “Red Alert” for air pollution in Beijing and its impact on both residents and the city’s birds. Article in Beijing Evening News about illegal bird trapping and the efforts of young people to tear down illegal nets, featuring Birding Beijing (in Chinese). Article in Xinhua about Birding Beijing. One of a series of articles about Brits in China ahead of the State Visit of Xi Jinping to the UK. Same article in Chinese here. Sino-US event on Beijing 2022 Winter Olympics. Article in The China Daily about EcoAction, a new and innovative Chinese company of which Terry is a Director. “Celebrating The Birds Of Beijing” in the gbtimes. Article in Science and Technology Daily about birding in Beijing. Article in The China Daily about the European Robin in Beijing. Interview on birding in Beijing on China.Org (English) and here in Chinese. Interview with Portrait Magazine about birding in Beijing. Published in March issue. Interview and field trip with Beijing Kids. Published in March issue. Sinica Podcast on “The Birds Of Beijing And The Air They Fly In” with Guardian journalist, Jon Kaiman and host Jeremy Goldkorn. Can be downloaded here. Broadcast of two 5-minute features about birding in Beijing on Phoenix TV (300 million viewers) 1955-2000 hrs. Can be seen here and here. Article in the Wall Street Journal about Beijing’s bird markets featuring Birding Beijing, Per Alstrom, Li Xiaomai and others. See here. Filmed by Phoenix TV (300m viewers) at Wild Duck Lake for a documentary about people passionate about Chinese wildlife. This morning, at 0715 Beijing time, I gave a LIVE interview about JANKOWSKI’S BUNTING on BBC World TV on the Newsday programme. The interview was shown globally and repeated several times during the day.